characteristics: Mountain ranges of Small Carpathians are hiding many mystical places. Only on a few of them man can find herds of Red Deer that concentrate here for autumnal rut. 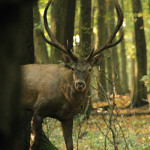 We will witness beautiful natural spectacle of Red Deer rut. 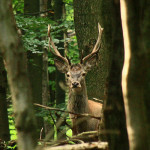 Other animals can be found beside Red Deer: Roe Deer, Wild Boar, Fallow Deer, Mouflon. From predatory species we can mention Red Fox, Wildcat, Badger or Weasels. Important information and trip conditions: We do not recommend to take children younger than 12 years or a dog. Overnight place is not suitable for people that are allergic on hay or dust. We recommend non rustling dress in camouflage colors (green, brown, etc.). We recommend to avoid dress in bright colors (red, yellow, etc.). Strong boots are required. In case of rain waterproof gear is highly recommended. Meeting at 4:00 pm, transfer to the site in Small Carpathians. 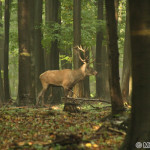 Slow walk to the forest will start at 5:00 pm while we will listen to first roars of rutting males. Then we will prepare forest hay loft for our overnight. We will wait for arrival of males. At first we will hear them, then we will observe this great unforgettable spectacle in the moonlight. In the morning we will take a walk in the neighbourhood and we will move to the place of our depart. Return to Bratislava is planned around 1:00 – 2:00 pm. The deadline for registration and payment is August 26, 2019. Please send the application forms to info@watching.sk, you can contact us also at +421 948 495 111.